Copywriting that brings brands into focus. The video and narration were produced and directed by Camp 4 Collective. I created the accompanying social and release copy for the launch of backcountry.com's latest brand video. The goal was to create copy that would excite customers to engage with the video and do it in a format that could be used for multiple social platforms in multiple lengths without straying from the voice or style of the brand presentation. 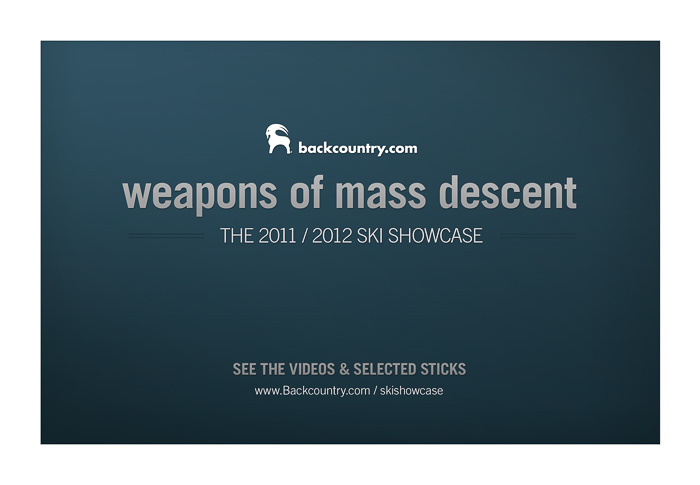 This brand video is the top-ranked result on Youtube for Backcountry.com and accounts for more than 400k views. Both the billboard at right and two-page print ad below were aligned with the launch of a targeted brand awareness campaign. Located just off the highway, the billboard was designed to help expand brand recognition in a manner that would introduce the Goat to new customers in Utah and Colorado. Other variations of the Backcountry billboards were located on resort roads in Utah and in downtown Denver, Colorado. Given the overwhelming quantity of advertising in most magazines and the high quality images native to Bike Magazine (30k circulation), the copy in this print ad was also designed for quick scanning. The image is given room to breathe and the terms 'Rip' and 'Click' are a bike culture colloquialisms that relate to the image (click into your pedals and rip) and the action of purchasing online. A continuation of this ad series follows the same theme and construction to support a consistent message. 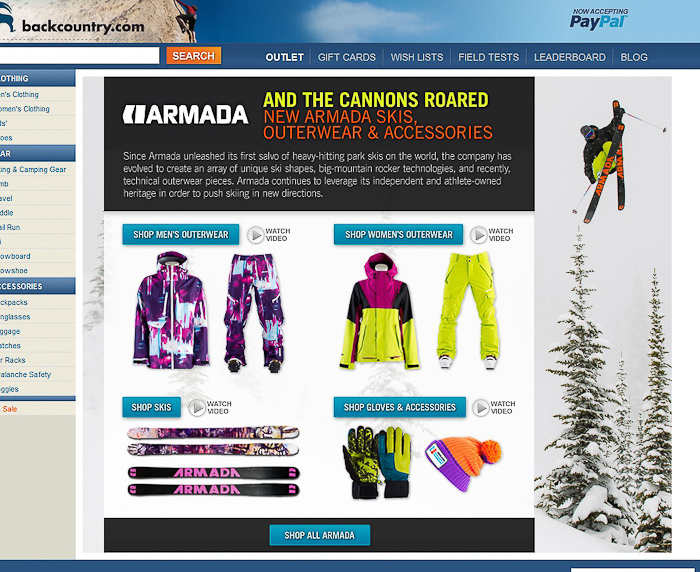 This small gallery displays a range of site banners, mobile banners, emails, landing pages, direct mailers, guide promotions, home page promotions, and product feature pages I've written for brands and products sold on backcountry.com. Balancing actionable, inspiring, and sometimes humorous messaging helped to promote these products and brands in a manner that grabbed attention without screaming for it. An added touch of brand voice speaks to the core audience and gives the aspirational customer something to feel they're a part of. These are just a few of the 400+ promotional assets I've written. An excerpt from the press release announcing the acquisition of Bergfreunde.de by backcountry.com. This release was circulated to national and international press contacts specializing in outdoor, recreation, and ecommerce. "PRESS RELEASE – PARK CITY, Utah (Dec. 5, 2013) – Backcountry, the established e-commerce leader in the outdoor, action sports, bike, and power sports markets, is pleased to announce the acquisition of Bergfreunde.de, the leading e-commerce company for outdoor enthusiasts in Germany, Austria, and Switzerland. With this acquisition, Backcountry enters the large, growing European market with a great brand and exceptional team with a solid reputation. Bergfreunde.de was founded in 2006 and has grown quickly with a focus on premium outdoor products, best-in-class customer experience, and an outstanding management team and employees. Although continents apart, both companies share a common vision — to be the definitive resource for the best outdoor gear on the planet." Click here to read the full press release on Transworld. 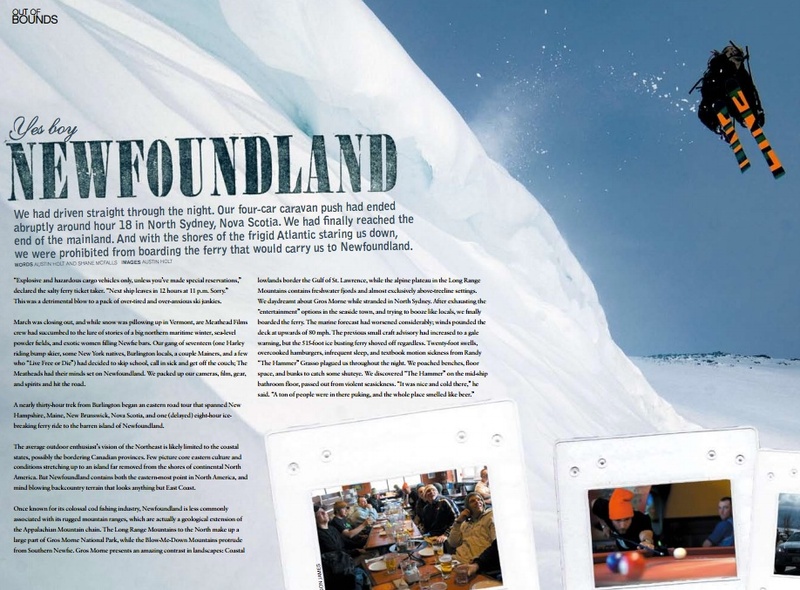 Adventure travel pieces like this are particularly fun to write. I co-authored this with a cinematographer who traveled with us. The article served as a hybrid content marketing and entertainment piece. We weaved in some of the brands and services that helped us and wrapped the whole thing in a compelling story that received strong positive feedback from readers. "A nearly thirty-hour trek from Burlington began an easter road tour that spanned New Hampshire, Maine, New Brunswick, Nova Scotia, and one (delayed eight-hour ice-breaking ferry ride to the barren island of Newfoundland"
Want to read another article? Here's an interview with Line Skis founder Jason Levinthal, Orage Brand Manager Mike Nick, and Professional Skier/TV Host Asia Magriby. I jump on opportunities to help grow brand authority and expertise through education. In this case I identified a growing problem in a niche market: air travel with an avalanche safety airbag backpack. Our competition had yet to address this issue, so I dove into a tedious and time consuming research process with airlines, brands, and various regulatory bodies. The end product shows that Backcountry is a valuable (and contemporary) educational resource for customers of high-end outdoor products, no matter how niche the product may be. Brand stories like this are an opportunity to do deep research and tell a rich story behind a company. 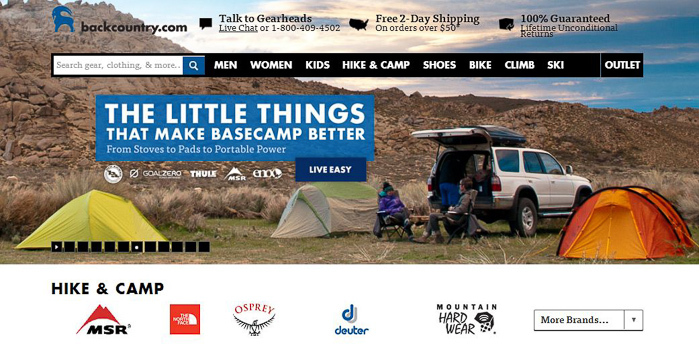 Backcountry.com uses these brand stories to introduce customers to the culture that bore the product they're purchasing. I wrote this brand story with the goal of surfacing Sanuk's surf heritage and to differentiate it from the run-of-the-mill sandals anyone can purchase (for much less) at the grocery store. "Slide your feet into a pair of Sanuks, smile, and pass a little happiness on to a stranger. Only footwear that’s not quite a sandal and not quite a shoe could inspire such a Zen-like feeling. Inspired by barefooted freedom, and with little but spare inner tubes and carpet at his disposal, Jeff Kelley made the first pair of Sanuks in 1997. This So-Cal company quickly developed a following of surfers, skaters, climbers, and other freedom-hungry souls. Sanuk’s footwear accompanies pro climbers Chris Sharma and Randy Leavitt and surfers Donavon Frankreiter and Dave Rastovich. With more styles, vibrantly colored models, and seemingly outer-space designs, Sanuk continues to move faster and with more heart than the massive, over-hyped corporate behemoths churning out cold plastic footwear. Toss a pair of Sanuks under your desk at work or beside your bed at home and take a little vibe-cation while you do the daily deed—we do…and we’re all the happier for it." 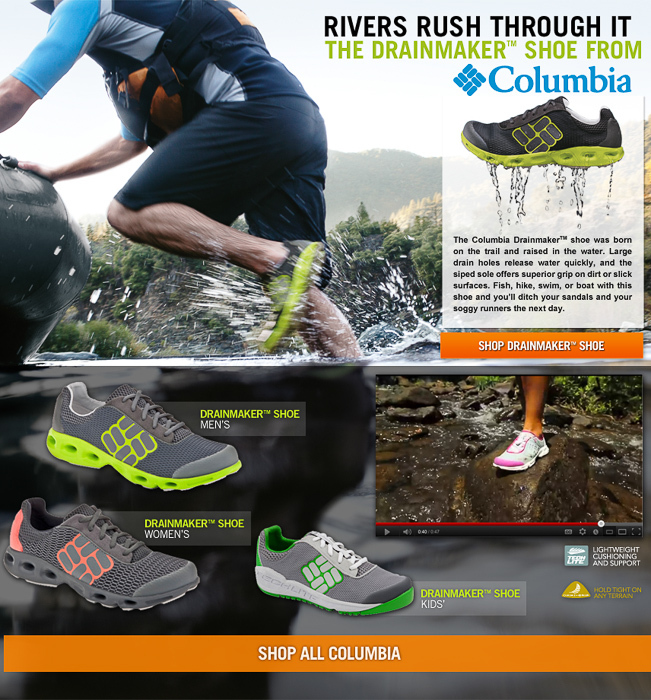 An example of a copy project that spanned across promotional, motion, and long-form deliverables. Rather than target the deepest of the core customers, the run guide sought to make the idea of trail running and trail running gear more accessible to the aspirational customer. I scripted six educational videos, created landing page copy, customized product descriptions, and modeled for on-location photo shoot. "Running watches offer everything from basic lap timing to the power of GPS tracking. Discover the features and functions that make a watch ideal for running on the road or hitting the trail." Here's an example of an iTunes description written for the Red Bull Media release Say My Name. Working closely with producer Stan Evans, I wrote media descriptions, press releases, contest rules, managed social media blasts, and created a microsite for the movie (now down). "Say My Name follows professional skier Grete Eliassen as she travels the globe and skis alongside Lynsey Dyer, Sarah Burke, Keri Herman, Ana Segal, Kaya Turski and Suzanne Graham. Shot in full high-definition, the film explores what it's like to be an international ski superstar pushing boundaries. In Grete’s words, “Women have been skiing hard forever and I want them to see the full circle that I live in, having fun in the park and taking sleds out into the backcountry.” Before exiting the 2010 season with locomotive-like energy, Grete slashed steep lines at Red Bull Cold Rush in Retallack, BC and then blasted 31 feet to set a world record on a hip jump in Utah. Since its inception, this movie has embodied a single message: inspiration." 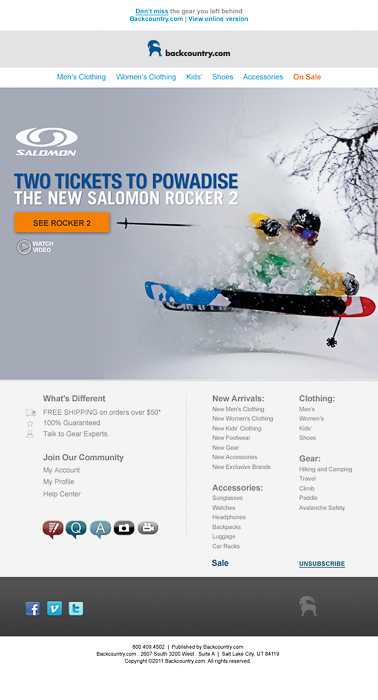 Backcountry.com product descriptions are an exercise in blending the retailer's brand voice with that of the brand of the product being sold. Most retailers use their copy space to drone on about technical specifications, instead, I saw this space as an opportunity to inject the culture and fun that inspires most people to spend hundreds or thousands of dollars on recreational gear. I created a customer profile for each product and modeled the style to speak to that customer. I've written close to 4,000 such descriptions. 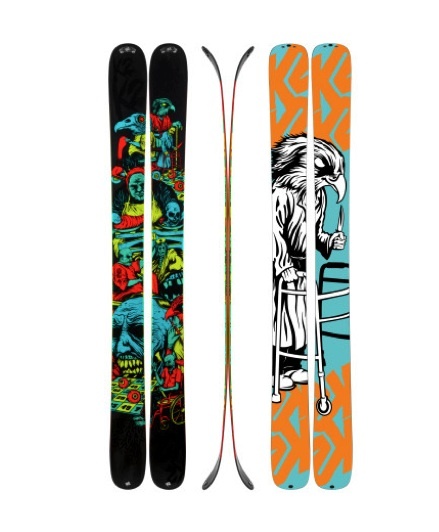 K2 made the HellBent Ski with pure evil—end of story. Ok, we'll admit that there's a freakish dose of width at the waist (132mm to be exact), the most aggressive tip and tail rocker in any K2 ski, and a fir and aspen core that flexes with powerful, yet buttery goodness ... but mostly this ski is just pure, unadulterated evil. It's a fiend for the bottomless feeling of 40-inch storms, the weightless feeling after airing a hand-carved booter, and the butterflies-in-your-stomach sensation of maching switch through blower powder. And should you and your hound-of-hell run into the nuisance of chopped up and tracked out slopes, there's a touch of traditional camber underfoot to balance out the rocker-happy shape. Can we get a 'hell yeah'?! Ingredients: fat, rocker, and of course, evil. Another product description, but here the challenge was justifying the added cost of a limited-edition product amongst a sea of similar, price-point products. This watch sat next to the standard Core model, yet cost significantly more. Attention to detail and a taste of exclusivity helped complete the content for this watch. With Suunto's 75-year jubilee logo engraved on the back and all the Core series navigation, weather, and chrono features packed inside, the limited-run Core Anniversary Edition Altimeter Watch is truly an instrument for the ages. This unique timepiece celebrates Suunto's long and storied history, so toss it on, pop a bottle, and join the celebration. Plenty of fellow die-hard outdoor addicts have Core watches, but your Core is one of a very few in the entire world. 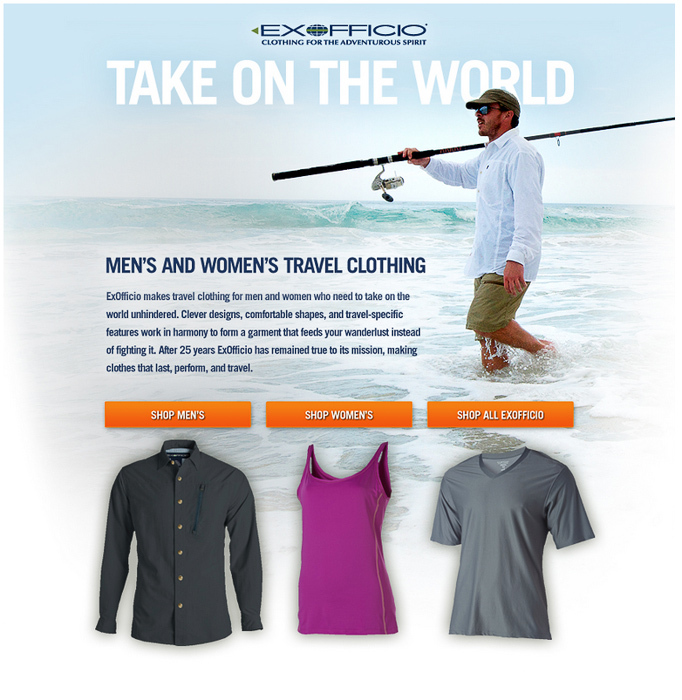 Read testimonials or send an email to request more samples.